Use the Company report to see which pages of your website interest potential conversions, and look at individual clickstreams to decide if a follow-up is required. 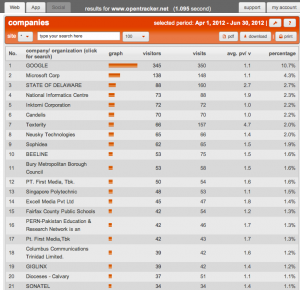 This report lists all known companies and organizations from which people visited your site. The report can be filtered by entering a company name into the search field, located in the Options bar. The columns in the table are; No., Company/ organization (click for search), Graph, Visitors, Visits, Avg. pv/ v, Percentage. Avg. pv/ v. means average pageviews per visit. This is a method of measuring Traffic Quality; in many cases, the better quality the traffic, the more time they will spend on your site. For example if you are trying to decide between purchasing traffic from two separate sources, and one source delivers traffic which looks at 1-2 pageviews on average, and another looks at 5-7 pages, then the decision is easier to make. The Companies report displays all visits to your site filtered by company or organization. Visually, the report is made up of a list of all companies and organizations from which visits were identified, in order of popularity. The definition of a “company” is an organization which manages its own connection to the internet, but is not a commercial ISP or host. Examples are commercial companies or businesses, universities, and government agencies. Click on a number in the ‘visitors’ column to see all clickstreams for that company. Click on the company name for an internet lookup/ redirect to that company index page – a good way to find contact information. Using the clickstream-per-company feature, you can drill-down to individual visitor profiles. In each profile, clicking on an IP number will display the ARIN registered phone number for that ip address. Enter any company or sector name into the search field, located in the Options bar. 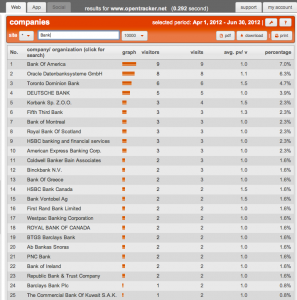 See screenshots below; results returned for sector; ‘bank’ and example company name: ‘hewlett’.